I have recently switched from D3 v3.0 to D3 v4.0, and I have already encountered some important changes. For example, the scaling functions are quite different, and the old layouts available in the older API have been moved and renamed. 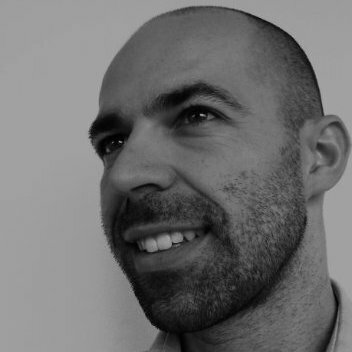 In fact, D3 v4.0 is no longer a single library, but many small libraries (about 30) that are designed to work together. 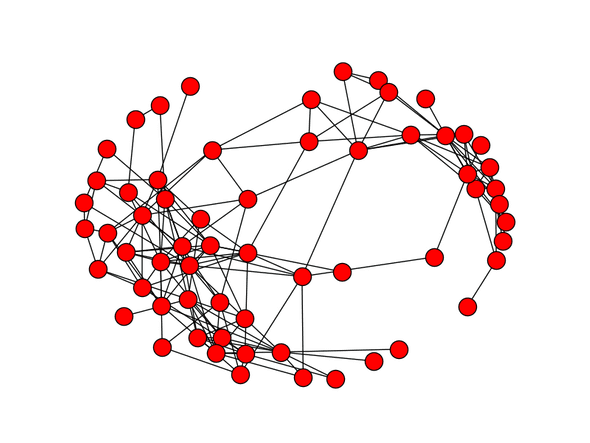 For a weekend project I wanted to create a visualization of a simple graph with nodes and edges. In D3 v3.0 this can be done with d3.layout.force. In D3 v4.0 this is a job for d3.forceSimulation. 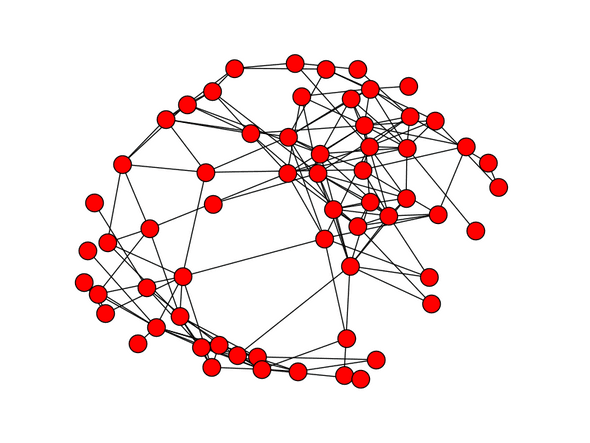 I started looking for JSON files that contained the necessary information to represent a small social network graph. To my surprise, I didn’t find any. Instead, I found some small network data sets as GML files here and here. I had never heard of the GML file format before, but since I liked these data sets I decided to proceed. At the end of the article you can see a visualization of a small social network of dolphins (62 nodes, 159 edges). The original file (dolphins.gml) was found on this page of the University of California Irvine. The Graph Modelling Language, not to be confused with the Geography Markup Language, is a portable file format for graphs. Creator "Mark Newman on Wed Jul 26 15:04:20 2006"
It doesn’t look to different from a JSON file, but the problem is that D3 cannot load it directly. After a brief Google search I found out that I could use a Python library to load the GML file and convert it into JSON. NetworkX is a Python package for the creation, manipulation, and study of the structure, dynamics, and functions of complex networks. It’s distributed with a BSD license and was developed by Aric Hagberg, Dan Schulz and Pieter Swart. In NetworkX one can create graphs for undirected and directed networks, add and remove nodes and edges in different ways, visualize the network and export network data to draw it with an external tool. In order to visualize the network data you can use the networkx.draw function and save the image as a PNG with matplotlib. Apparently there must be some randomness when the figure gets generated, because I ran the code twice and I got 2 different PNG images. The network data can also be exported and visualized in a program like GraphViz or Gephi, or, like I will do here, in D3. I didn’t play with NetworkX too much, but from what I’ve seen the documentation is great. There is also a nice presentation here. Note that the GML file I used with the latest NetworkX version (1.11) caused the Exception networkx.exception.NetworkXError: cannot tokenize u'graph' at (2, 1). I downgraded NetworkX to version 1.9.1 as suggestes in this thread and it worked fine. Another approach would have been to format the GML file in a different way. Finally, with the network data available as dolphins.json, we can use d3.json to read it. Drag a node or hover on it to know the name of the dolphins in this network! The file dolphins.gml contains an undirected social network of frequent associations between 62 dolphins in a community living off Doubtful Sound, New Zealand, as compiled by Lusseau et al. (2003). D. Lusseau, K. Schneider, O. J. Boisseau, P. Haase, E. Slooten, and S. M. Dawson, The bottlenose dolphin community of Doubtful Sound features a large proportion of long-lasting associations, Behavioral Ecology and Sociobiology 54, 396-405 (2003). D. Lusseau, The emergent properties of a dolphin social network, Proc. R. Soc. London B (suppl.) 270, S186-S188 (2003).